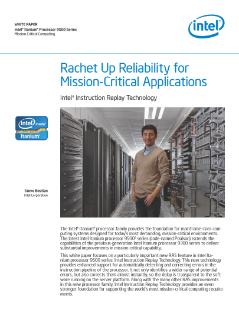 The white paper focuses on the new reliability, availability, and serviceability (RAS) feature in the Intel® Itanium® processor 9500 series called Intel® Instruction Replay technology. This new technology provides enhanced support for automatically detecting and correcting errors in the instruction pipeline of the processor. ...It not only identifies a wider range of potential errors, but also corrects them almost instantly, so the delay is transparent to the software running on the server platform. Along with the many other RAS improvements in this new processor family, Instruction Replay provides an even stronger foundation for supporting the world’s most mission-critical computing requirements. Read the fullIntel® Instruction Replay Technology Detects and Corrects Errors White Paper.